President Pervez Musharraf announced Wednesday he had asked for British help to investigate the assassination of opposition leader Benazir Bhutto as authorities pushed back crucial elections six weeks until Feb. 18 citing the unrest caused by her killing. Opponents condemned the postponement but said they would still contest the vote seen as a key step in Pakistan's transition to democracy after years of military rule. "We have decided to take part in the election," said Asif Ali Zardari, Bhutto's widowed husband and now the leader of her Pakistan People's Party. "People should be peaceful and express their anger through their ballots." In a nationally televised address, Musharraf said that the death of Bhutto, a two-time prime minister, was a great tragedy for the nation. He blamed "terrorists" for her assassination. "We decided to request a team from Scotland Yard to come. I sent the request to (British) Prime Minister (Gordon) Brown, and he accepted the request," Musharraf said, adding that the British team would provide assistance to local investigators. The government has resisted calls from Bhutto's party for a U.N. committee to probe the killing, and Musharraf's agreement accept help from British investigators appears a compromise step to address growing suspicions of a government cover up. Since Bhutto's slaying last Thursday, the government has come under harsh criticism for its security arrangements for her, its claim that an Islamic militant was behind her death and its conclusion that it was the force of the blast and not gunshot wounds that killed her. Musharraf accused "many miscreants and some political elements" of taking advantage of the tragedy to loot and plunder - a reference to the rioting that has killed nearly 60 people and caused tens of millions of dollars in damage. But he had reconciliatory words for Bhutto's supporters, saying their slain leader had wanted to promote democracy and end terrorism. "My mission is also the same. I want to end terrorism and let democracy flourish. It is my conviction that the development and survival of Pakistan depends on it," he said. "We need to fight terrorism with full force, and I think that if we don't succeed in the fight against terrorism, the future of Pakistan would be dark." "This is a time for reconciliation and not for confrontation," he said. Musharraf said he had wanted elections to go ahead as planned on Jan. 8 but destruction of election offices in the rioting in Bhutto's home province of Sindh had made that impossible. He said he supported the decision to delay the vote until Feb. 18. The decision was condemned by Bhutto's party which says the government is not sincere in holding fair elections but would contest them anyway. The party of former Prime Minister Nawaz Sharif quickly followed suit. "We will not leave the field open for the king's party under any circumstances," party spokesman Ahsan Iqbal told the AP, referring to the ruling party, which is allied to Musharraf. The opposition alleged authorities were postponing the polls to help the ruling party, amid expectations that Bhutto's group could get a sympathy boost at the polls. The ruling party could also suffer a backlash. Bhutto had accused elements within the group of plotting to kill her, a charge it vehemently denies. Zardari's calls for restraint by Bhutto's supporters suggested that the party would call for street protests against the delay. Election Commission head Qazi Mohammed Farooq said the unrest had made it impossible to hold the polls on time. "For a few days the election process came to a complete halt," he told reporters. As a result, the poll will be held on Feb. 18, not Jan. 8, he said. Talat Masood, an independent political analyst judged the delay was "mostly about politics." "The (election) problems are only confined to a few districts. Musharraf naturally thinks if a hostile parliament comes in he has no future." 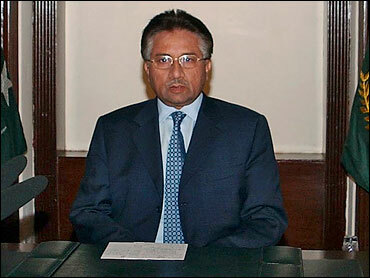 Sharif's party reasserted its demand for Musharraf to resign. "We will try to continue to make all parties join hands to force Musharraf from office and set up a neutral caretaker government," Iqbal said. Spokesman Tariq Azim, from the ruling party, denied it would benefit from the postponement. "Let's face it, a delay of a few weeks is quite understandable. We would have thought parties would go along with the decision of the election commission," he told Dawn News TV. The White House expressed no objections Wednesday to the delay in the Pakistan elections, reports CBS News correspondent Mark Knoller. Press Secretary Dana Perino said it was important that a specific date has been set, adding that the United States hopes the Pakistani people can have a free and fair election with the widest possible participation. Pakistani troops, meanwhile, killed up to 25 suspected militants Tuesday in a remote region close to the Afghan border where al Qaeda and Taliban fighters operate. The fighting followed the abduction of four soldiers the same day, said army spokesman Gen. Waheed Arshad and an intelligence official. Security forces sustained no injuries in the clashes, which frequently break out in the area. The government has blamed South Waziristan-based militant leader Baitullah Mehsud for Bhutto's murder, but he has denied involvement. In his address, Musharraf did not explicitly blame Mehsud but he appealed to the media and Pakistanis to "expose" him and another prominent pro-Taliban militant leader Mullah Fazlullah, whom he also accused of orchestrating suicide attacks. Also Wednesday, French Foreign Minister Bernard Kouchner met with Musharraf but canceled a planned trip to visit to Bhutto's hometown to pay condolences, a French embassy official said on condition of anonymity because he was not authorized to comment. He did not give a reason for the cancellation. Nisar Khuro, a senior member of Bhutto's party, alleged the government had stopped Kouchner from traveling there, citing security concerns. "It seems that Pervez Musharraf is stopping foreign dignitaries from coming for condolences," he said. "This is sad." Later, Kouchner laid a wreath close to the spot where she died and observed a few moments silence. "I pay respect to the memory of a fighter for democracy and freedom," he told reporters at the scene. "Her message and her bravery will never be forgotten." Bhutto was popular with many Western governments because she was a liberal Muslim prepared to speak out against extremism, but critics in Pakistan often pointed to how her two stints as prime minister in the 1980s and 90s were marred by allegations of corruption and inefficiency.